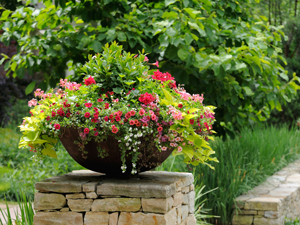 Container gardens are versatile and beautiful. 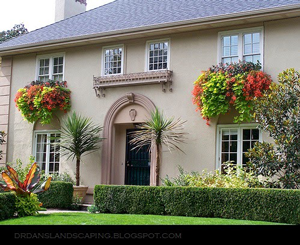 They add lush appeal to porches, patios, balconies and window boxes. But at summer’s peak, keeping your container garden watered and healthy can be an ordeal. When temperatures rise over 85 degrees F, most plants will require daily or twice daily watering. The beautiful annuals and delicious herbs you planted in the spring suddenly become a chore just to keep alive. And who hasn’t returned from vacation to find pots of brown, dead plants? Water your pots and containers effortlessly with a drip irrigation installation. Our expert techs develop a drip irrigation plan for your container gardens that works with your existing lawn irrigation system. They work with you to meet the needs of your individual plants. Piping is run inconspicuously into your pots to deliver just the right amount of water to your plants. 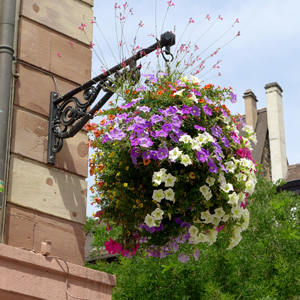 We can even install drip irrigation into window boxes on the second floor or into your hanging baskets. Drip irrigation installation costs less than you might think, especially considering how much time it will save you. Give us a call or send us an email to get a quote. 513-379-5780 or info@tristatewaterworks.com.